Respected journalist and historian, Colin Grainger, gathers memories of the dozens of pubs around London’s Royal Docks, from the people who frequented them on a regular basis during the industrial heyday of the area. Much of the attention regarding the regeneration of London’s Royal Docks is understandably focused on the large-scale projects that will bring businesses and communities back to these iconic East London waterways. But there are some smaller success stories that bring back fond memories of social lives of the people who lived and worked around the Royal Docks. And another application has gone to Newham Council for licensing and music and dance entertainment for the Lockside Kitchen and Bar in Aird Point in in Lockside Way, North Woolwich/Beckton, near the Gallions Point Marina. Earlier this year we wrote about Husk Brewing, the first brewery to be established in Silvertown. Earth Station in North Woolwich, meanwhile, focuses on brewing world-class beer with a social conscience. These good news stories hint at just how important pub culture was to the past communities of the Royal Docks. Since the 1970s, 53 pubs have closed in the E16 Royal Docks postcode area, made up of Silvertown, North Woolwich, Custom House and Canning Town. Of the 26 pubs we once had in Silvertown, West Silvertown and North Woolwich, three remain. In the heyday of the community Ferry Festival in the late 70s and early 80s, there was a pram race featuring stops at public houses in North Woolwich and Silvertown. Ten pubs and many laughs. The Henley Arms and the Royal Standard survive. The Ram remains in West Silvertown. Lesley Quirk, 61, said a number of boozers were a “home from home” for her lorry driver father Tom. “Every spare second he had he would spend down the pub. It was the tradition in the 60s, 70s, 80s and 90s. More so than now.! Jewellery, records, videotapes, there seemed to be a never-ending supply of goods, along with cigarettes from the nearby Phillip Morris factory. The Graving Dock Tavern in North Woolwich Road, West Silvertown, built in 1867, is remembered fondly by many. Barbara Laws played darts there. I have a memory of the pub which I thought time has clouded but Cliff Sealy remembers the layout which oddly had a saloon bar and public bar, with an off-licence for off sales in between the two! The pub, like many in the 70s, 80s and 90s, gave regulars diaries to say thank you for their custom and remind them where to drink! Catherine Finlayson said her granddad used to play the piano in the pub. John Ford was the guvnor in the 90s to 2000s. His dad Bill was the boss of the Three Crowns. The Royal Pavilion, known to many locals as The Pavi, is now being developed into a block of flats and has a superb view of the River Thames. Jubilee landlady Hannah Bowden and her married daughter Phyllis Newell who lived in the pub at that time and whose husband Reg served behind the bar. I have also unearthed from the Grainger and Quirk family archives, pictures of beanos for both men and women from Canning Town and North Woolwich in the 40s and 50s. The Connaught Tavern is one of the remaining pubs. It has been called The Fox@Connaught since 2003, but the inn dates from 1881 and is a Grade II listed building. The dockside Connaught Tavern originally opened to cater for passengers disembarking from craft berthing at the Victoria Docks. But as passenger numbers reduced the pub found itself catering more for the dock’s labourers and became a daily congregation point for those waiting to be picked for work. It served generations of dock workers and is famous for many years because the ‘Iron Lung’ stood outside. The Grade II listed Victorian cast iron urinal weighing over a tonne was officially called The Rotunda. The gentleman’s pissoir by CS McDowell is the only surviving circular public urinal in London and was listed in 1983. After the closure of the docks in the 80s it gradually deteriorated and Newham Council eventually sold it off to the now-defunct London Docklands Development Corporation for £1. It was refurbished at a cost of £47,000 and is now in storage in a container in the docks. 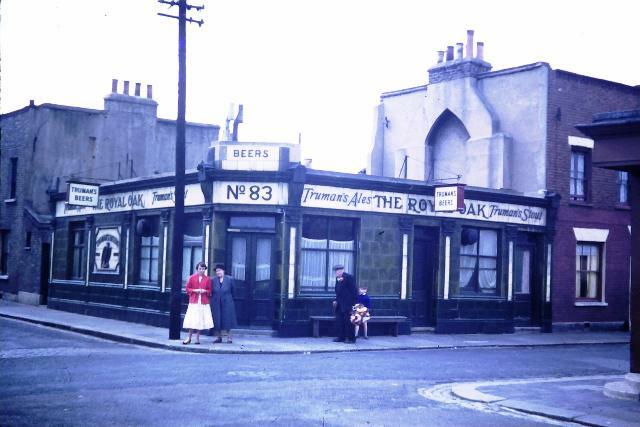 Local drinker David Conroy said that one of the pubs that are no longer with us is Cundy’s, or to give the official name, the Railway Tavern in Silvertown. David used to drink in the pub and the Royal Albert. Fast forward to later life, the pub hosted the Peacock Gym in the 1980s, but then went downhill until it closed. The Truman’s pub was built in 1872 and boasted some very fine Truman’s tiled signage, which is amazingly still visible today. Wartime bombing resulted in the loss of the upper floors but it carried on as a single storey pub, later completely surrounded by redevelopment.